To improve the sharing of Fair Oaks history, the Directors adopted a Society policy of making “copies of historic photographs in its collection available to the public as a fund raiser” according to a price structure, with an acceptable use statement signed by each purchaser. To improve the rate of return on Society funds, the Directors approved moving a portion of our savings account into a money market account. 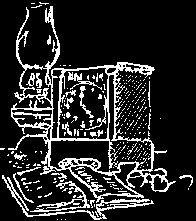 The Society will host the May 22 meeting of the History Consortium, in the Old Fair Oaks Library, 10AM-2PM. Be sure to mark your calendars for our second Soup Night Fundraiser on November 7. The fundraiser committee is hard at work on obtaining special bowls for the event as well as a corporate sponsor for the wine. Your help is needed. Can you serve as a Docent? Assist with Membership Registration? Or be a Greeter at one of our general meetings? Why not bring a guest to the April 22 General Meeting? Joe, Janet, Sherry and Ken are installed as officers by Kathy Jones, Chamber President. Warren looks on. January greetings...Larry is paying dues to new Treasurer Joe. Trude, Publicity Chair, checks with Lois. Vice-President's Message: Program:Lee and Mary Scott, current owners of the Murphy-Scott Building (circa 1902), will show historic slides and discuss the history of the building. The building is located near the corner of California Avenue and Fair Oaks Boulevard and is shown as number 14 on the Fair Oaks History and Walking Tour map which will be available at the meeting. 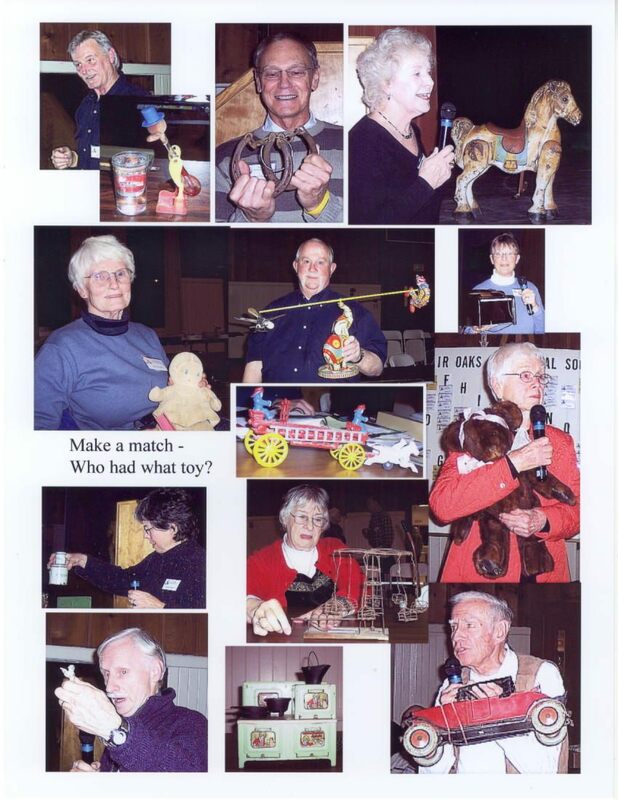 Recap of January 2008’s Program: I would like to thank all members who participated in January’s potpourri by bringing their “Favorite Toys” or sharing their memories. Douglas and Joann Schwilk-Douglas shared his metal Army man and told of playing with marbles, which was his favorite pastime. The marbles are now in a lamp in his office. Joann shared small baking tins to be used for a child at play. Pete White shared one of his collectables the wind-up Bunny Express trains from the 1930’s. Meg Smart shared her most lovable and huggable possession Minnie the Teddy Bear. Minnie was made from a fur stole that her mother used to wear and she herself had worn in the 1940s. Lynn Steen shared a 42-year-old doll cradle that was hand made and painted for her daughter. Larry and Dorothy Huggett-Larry shared his Hercules toy car with dent he put there himself. The car is between 75 and 80 years old. Dorothy shared a handmade merry-go-round that her father made. It has individual swings and still works with its original hand crank. Judy Bloomquist shared her “Little Orphan Annie Child’s Toy Electric Stove” from the 1930s along with the original cast-iron pots and pans. She and her sister use to bake carrots for her father to eat. Jane Whitnack shared a 75-year-old handmade doll. She loved this doll so much when she was a child that she copied and made one for each of her 5 grandchildren. She also painted a watercolor of the doll from her memory showing the doll’s true colors. Sue Easterbrook shared MOBO, a riding pony that she had purchased at a garage sale in the 1970s for only $10, and is now worth $350. Richard Thorn shared a horseshoe game of two horseshoes and chain. This is a great puzzle that is fun to play with and makes your brain work too. Sherry Wood’s favorite toy was a “Farman” riding toy tractor that she shared with her brothers and sisters. Sherry remembered all the fun on the tractor and purchased an old riding toy tractor for her son to enjoy in the 80's which is still being used by all small visitors to her backyard. Hugh Gorman brought a “Dippy Dog” toy that is fun to watch and brought hours of fun and laughter to many. Terry Gorman and her niece Lilly brought Jerry Garcia and anteater Beanie Baby toys. Warren McWilliams shared his fire engine #21 and his love for marbles from his Grand-Dad that he kept in a tobacco can. We all have memories of something in our childhood that we enjoyed and played with. Those of us, lucky enough to still have that toy, have added enjoyment for our members by bringing them to the January General Meeting. Thank you for sharing! July 2008’s Program: Members of the first graduating class of Bella Vista High School will share what it was like to be the first class to attend Bella Vista. Being the first at a new school provided them with many opportunities and responsibilities. This year marks 45 years for the first graduating class in 1963. 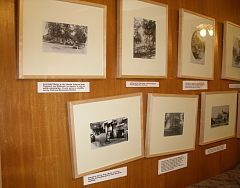 - Webmaster - Our New Year's resolution was to get the bulk of the Fair Oaks Historical Society's old photos scanned in high resolution. It was a daunting task since we have over 400 photos in our collection. It's a pleasure to announce that with the help of Lois Frazier, Gordon Heidt, Joe Dobrowolski and Ken Steen, we got the job done. Thanks to all. We continue to get requests for reprints (or use) of our old photos. A publishing company doing a book on Sacramento County in the late 1800's asked for some of our photos to use in the book and may use five or more of them. They'll give us one copy of their book for each photo used, so we'll have some interesting raffle prizes. Another request came from a real estate developer's office for photos to dress up their sales office, and that request led to the FOHS Board developing a policy at their last meeting for providing prints of old photos and making some money for the Society in the process. We're going to create prints of probably 30 or so of our "classic" photos and have them available for sale in a binder at the museum. I'll bring the binder to the April general meeting for the members to see. Members can get prints at half price. One of our website viewers wrote that while doing research on a Fair Oaks family, she found the on-line book "Fair Oaks and San Juan Area Memories" so interesting that she read it cover to cover on-line - all 103 pages of it. Another warm toasty feeling for the website - we've learned that Ann Dobek, a third grade teacher at Twin Lakes Elementary is using our website in her history lessons to show her students what the area looked like way back when. Neat! One dark and stormy night a sad little pigeon lost his way. Confused, he flew down the chimney of the fireplace in the History Center. The unfamiliar surroundings were thoroughly checked out. The pictures on the wall, the display cases, the doll buggy and the ivy plants showed evidence of his interest. 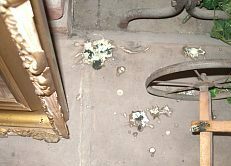 The alarm system alerted the Parks and Recreation security person who assisted the pigeon in leaving by the front door. Don't think badly of this friend. Nothing was broken or damaged. With the help of Rose Ann Lamb and Fran Sargent, we were able to clean all evidence of his visit. The 59th annual Fair Oaks Spring Fest will be on May 3rd and 4th. The History Center will be open to the public both days from 10:00 A.M. to 4:00 P.M. Docents needed. The Fair Oaks Cemetery will celebrate Memorial Day on Sat. May 24 at 10:00 AM. A patriotic program including speakers, bands, the Fair Oaks Village Singers is planned. The Historical Society and the Orangevale/Fair Oaks Grange will serve cookies and punch. We will need 15 people to bring 2 dozen cookies. Sign up at the Potluck. The following people have been docents this year: Gordon & JoAn Heidt, Diana Lennon, Lois Frazier, Meg Smart, Evelyn Heim. Thank you. It was Greek Night at the White House on March 5th. 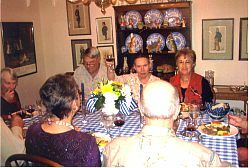 as Pete and Nancy hosted the Burmaster party of eight to a festive evening. Ray Burmaster had bought the Soup Night Silent Auction item for his wife Sue. 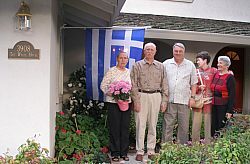 Besides an Ouzo shot and Greek appetizers to start the evening off, the group did a line dance in the patio taught by the White's friends who helped prepare this authentic meal. Dishes included baked lamb, salad with feta cheese, baked vegetables accompanied by Greek wine and Baklava, coffee and a Metaxa nightcap. It is always a pleasure to visit the White House for its many collections and conversation pieces. This evening was a delight for all guests...THANK YOU for your generosity which added to our History Center Fund. Following another great Potluck, the meeting was called to order by President Warren McWilliams. 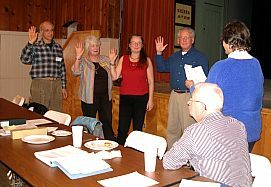 The officers for 2008 were installed by Kathy Jones, President of the Fair Oaks Chamber of Commerce. The officers were as follows: President Ken Steen; Vice-President, Sherry Wood; Treasurer, Joe Dobrowolski; and Secretary, Janet McWilliams. Warren then reviewed his two years in office. Ken Steen then took over the podium. He then presented Warren with a gift certificate to Slocum House. Ken also shared with the group his plans for the future. Pete White’s Historical Moment: Pete shared with us remembrances of Fair Oaks in the early 1950’s. He talked about getting his first Schwin bicycle, which was delivered at the Rail Depot which was located across the Fair Oaks bridge. Pete also shared with us the location of several locations of businesses in the Village at that time. Program: Sherry Wood then introduced the program. As usual in January the program was a sharing of the memories of individual members. This year it focused on Toys that various members brought and shared their stories. Minutes: The minutes of the previous meeting were approved as published in the Newsletter. Janet also shared a summary of the Board meeting held in December. Treasurer’s Report: Treasurer Joe Dobrowolski announced that the books were audited by Richard Thorn and found to be in great shape. We have total assets of $27, 442. Richard Thorn requested that we get any receipts to the treasurer in a timely manner. Kitchen Committee: Warren and Judy Blomquist were introduced. Ways and Means: Marilyn Dupray will continue in this position. 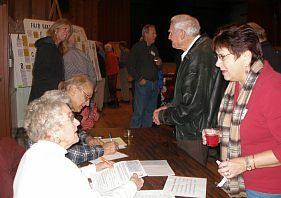 History Center: Lois Frazier announced that we had 36 at the December Open House. On January 6th, the center was open for the Organ Concert, it was a suessful event. She talked about the organ which is housed in the Clubhouse, originally came from San Jose. She also asked for docents to sign up for the next few months. Newsletter: Marilyn asked for help on the house to be featured in the next newsletter. History Liaison: Warren reported that the Park District has not been able to acquire space at the Fair Oaks Elementary School, they are still trying to negate with the School District. Warren also reported that he will be attending the Sacramento County History Consortium meetings. Publicity: Trude Vasquez asked that we contact her about events we need to be publicized. She also reminded us that the American River Messenger needed the copy four weeks in advance. Soup Dinner: Maria Brugger thanked everyone for their help. Claudia Thorn and Lyn Steen were introduced as the new chairmen. November 7, 2008 will be the date of next years dinner. Claudia asked us to be looking for donations for the Silent Auction. There was no new business, the meeting was adjourned after the completion of the raffle. Note: The minutes of the Jan. General Meeting are included here and will not be passed out at the 4/22 meeting. Kate Woodward - After 1930 - ? Addison Gilmore and his brother Vernon, with their families, came to Fair Oaks from Minnesota in the early 1900's. Land records show that Addison Gilmore owned the property in 1910 when the house was built. Joe Broadley is presumed to have been the builder. Addison, by census records, moved into the house after 1920 so he probably rented it out for a number of years. Addison is shown in the 1930 census living in the house with Kate Woodward next door. Kate owned the property next with an interim of renters. The current owners, Deborah and Bill Brown, both agree that each former owner has given their heart and $ to improve the home and property. Don and Jackque Martin added the family room to the back of the house, a detatched garage and paved driveway and an inside entrance to the basement. The Browns have added footage to enlarge their breakfast nook and enlarge/update their kitchen. They landscaped the 1/2 acre and were on one of the Fair Oaks Bluff fundraising garden tours. They have focused on keeping the home in the tradition to the time it was built. The front of the home is close to the original except for the shape of the pillars. 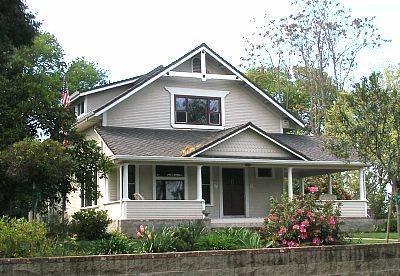 It is currently a 2 bedroom home with den, 3 bath, living room (parlor), dining room, family room with a porch front and back. There is a full basement for utilties and exercise! A next project is remodeling the Master Bathroom. Jeff Jacque and Helen Shunk owned the property for less than 2 years and lived in it only a short time. Bill was looking for a Fair Oaks residence to be closer to their business, and one day left a business card in the doorway of the unoccupied house. That resulted in a contact, and ultimately the couples closed the deal in 1999 on a napkin at Carmelita's restaurant. Story One: A Fair Oaks Irrigation employee and wife rented the upstairs and said it was the "best 5 years of their marriage." Story Two: A group of "bikers" rented the house and had "wild parties." The place looked "seedy." The bikers parked their Harleys in the basement and took off up the driveway with gusto to the annoyance of neighbors. One day one of the bikers didn't make the turn at the top of the driveway and ended up across the street in the neighbors front bushes. Deborah and Bill are owners of Bella Fiore, Inc., florest and event specialists in our village at 10239 Fair Oaks Blvd. They share our interest and care for the Fair Oaks Community. Bill is a third generation resident of Fair Oaks (both he and his father were in the Fair Oaks Fire Department) and Deborah was raised in Roseville. Thank you for a great interview!